I picked this book up as a quick read, appropriate for Halloween. I finished it in about an hour, with a lot of distractions. It definitely fits the bill as a quick read and I think my students will enjoy it. Maxie is angry- very angry. Her older brother, Derek, disappeared on his way to school 2 years earlier. Now, her parents are struggling to deal with his absence and overlook Maxie in the process. When the family finally receives the dreaded call, telling them Derek’s body has been found, she thinks they will finally be able to move on and be a normal family again. However, her mother only falls deeper into depression and her father continues to snap at her. When Maxie begins receiving mysterious phone calls telling her that Derek is still alive, she doesn’t know how to react. I am not normally a fan of mysteries, but I did enjoy this book. I think because I am always fascinated by the news stories about missing children I wanted to find out how this novel ended. I had never read any of Macphail’s books before this, but I would be interested in reading some more from her! 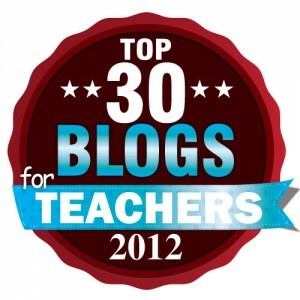 While jumping from blog to blog, I stumbled upon a post at Learning and Laptops. It immediately caught my interest because I am still exhausted from our parent-teacher conferences last week. We have 3 nights of conferences and one afternoon and we make appointments with parents for 15 minutes each. Ninety-nine percent of our parents come to the conferences and they normally focus on grades and a lot of small talk. It always bothers me that conferences seem to serve as nothing more than a face-to-face reading of the report card (or the report card to come!). Learning and Laptops has taken conferences in a new and exciting direction! What an amazing concept! Students filled out the assessment and brought a copy home before conferences so parents could read them. Then, the parents and teacher were able to discuss that student’s actual learning and feelings at the conference. What a valuable use of time! Parents were able to take the time to react to the assessment at home and then reflect on it with their child’s teacher. Many parents and students took the time to reflect on the conferences and their thoughts regarding the new format right on the blog- most of the comments are positive! This is definitely something I am considering for the next set of conferences, in the spring. I would have to rework the student assessment slightly for my grade level, but my students are definitely capable of reflecting on their learning. I think metacognitive thinking is so important for learning at any age and a habit that students should get into. I already build metacognitive strategies into my reading and writing workshop, and would love to bring into more areas of the classroom. I’ve been working on my writing curriculum for the year. Our state testing has been moved from March to May, so I am not as rushed as I was in the past. Because of this, I don’t have to teach persuasive writing now, like I normally would. I can push that off until later in the year. I’ve been fooling around with different ideas and I think I know what I am going to do: NaNoWriMo. It turns out that the awesome people over at NaNoWriMo have a separate site dedicated to young writers. They even have a curriculum, with sample lessons! I usually hesitate when it comes to teaching fiction because I am uncomfortable with it and my students usually have a very tough time with it. However, writing fiction in conjunction with NaNoWriMo seems like it will be a lot of fun! Last week we had Parent-Teacher Conferences at school. No matter how prepared you feel, this is always a very long and stressful week. I started thinking about how I destress and wanted to share what I came up with. My district has decided to give me district days for my monarch trip in February. That means I have 2 professional development days to put to good use this year! I have spent today scouring the internet for workshops and I am coming up empty! Ideally, I would like two separate workshops- I am looking for something in Responsive Classroom, reading workshop, or writing workshop. It needs to be in NJ and preferably the cost should be $50 or less (we are reimbursed up to $50). Anyone have any ideas or recommendations? I am coming up with nothong, no matter what I google! I repeated the mantra over and over in my head as I rolled the thick, heavy wedding band across my thumb. Below my feet, the wooden planks that made up the dock seemed to have spaces the size of textbooks between them. I inched the ring up higher on my thumb, feeling the large space between the metal and my skin, as I imagined the horrified gasps of the wedding guests when I dropped it. In my mind, I could hear the plunk of the heavy ring on the wood followed by the bloop of the ring hitting the water before sinking to the bottom of the bay. Gripping it tighter, I repeated my new mantra under my breath, “Don’t drop the ring”. “May we have the rings?” the minister asked suddenly. With a sigh of relief, I handed over the wedding band. As Julie turned to place it on Scott’s finger, I bent down to straighten her train. As I did so, I glanced at the dock beneath my feet and uttered a silent byt grateful prayer of thanks to whichever god looks over small-fingered Maids of Honor and expensive wedding rings. I have great news…..this weekend I received word that I have received a fellowship from EIRC/Geraldine Dodge Foundation to visit Michoacan, Mexico! For those unfamiliar with this part of Mexico, I will be visiting the Monarch butterfly sanctuaries right before the butterflies begin their migration back to the north. Now, I just need to get permission from my district to go on the trip. I will use both of my professional days, but will need two more from the district. Wish me luck!